Japanese Episode AG 082: "Mori no Kakutou Ou!? Wakashamo VS Kinogassa!" American Episode 354: "A Shroomish Skirmish"
Satoshi and his friends are eating outside one day, enjoying Takeshi's cooking. A fight breaks out when Satoshi's Heigani takes some of Achamo's food, causing everyone to run about frantically. Meanwhile, the Rocket-Dan are lying down, starving, when an apple falls into Kojirou's hand. 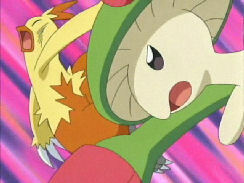 The apple belongs to a group of Kinokoko who live in the forest, so the Rocket trio take all of the pokemon's apples. They don't seem concerned at the group of angry pokemon until a few of them evolve into Kinogassa, a tall fighting-type pokemon! The mushroom pokemon chase the Rocket-Dan toward Satoshi-tachi's campsite, where Satoshi and the gang are recovering from their own troubles. The Kinogassa appears and attack, causing everyone at the campsite to be sent blasting off. Our heroes and the Rocket-Dan are split up into small groups , and everyone has their own adventures as they try to reunite with their friends. Masato, Nyasu, Haruka, Heigani, and Achamo end up at the bottom of a large pit where the mushroom pokemon store all their fruit. The pokemon attack, and Satoshi's Heigani works overtime trying to protect Haruka's crying pokemon. Just as all hope seems lost, Haruka's Achamo evolves into Wakashamo! As everyone else arrive on the scene, Haruka's pokemon, who is now part fighting-type, has a one-on-one battle with the leader of the Kinogassa. 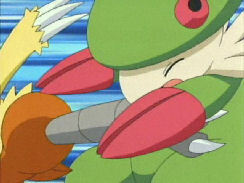 After some hand-to-hand combat without any special pokemon techniques, the two pokemon gain a mutual respect and stop their battle. With the conflict resolved, Satoshi and his friends decide to resume their meal, this time with Haruka's new pokemon. Well, this episode concludes the string of spoilers we see in The Challenger!! opening regarding pokemon captures and evolutions. And in all honesty, Haruka's Achamo evolving from the cuddly little mascot pokemon into this rather unattractive creature is the evolution I least expected. You'd figure the anime producers would have just given Haruka a bunch of cute pokemon and be done with her, but the fact that one of her weakest pokemon gets this upgrade proves to me that the anime wants Haruka to become a really strong trainer. Now that the dubbed version is out, it's safe to watch Destiny Deoxys without having spoilers thrown at you left and right. Anyway, the English version of this episode shortens the big fight at the end of the episode, but I expected as much when I watched the episode in Japanese. Though I really have to question the censors' mentality when cutting the sort of footage they do; why is getting hit in the face six times worse than getting hit in the face twice? Either way we see that the pokemon's getting hit in the face. The Japanese ending theme, Smile, is updated as of this episode to include Wakashamo among Haruka's pokemon. The first three seconds of the pan shot that starts the episode off are cut. When Heigani is getting hit in the face by Kinogassa (in the dub, it's the shot right before Max's "Corphish...it's fightin' just to protect Torchic and it's gettin' hurt"), it gets hit for two seconds longer in the Japanese version. 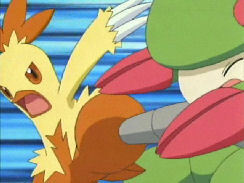 When Wakashamo and Kinogassa have their fight when they battle without using any special pokemon techniques, we see them clawing and kicking at each other for a while before the camera switches over to Heigani. In the Japanese version, that clawing and kicking lasted a whole ten seconds longer, with the Japanese version more or less repeating the same footage over and over. 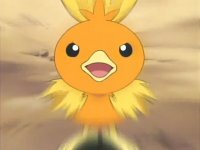 After the shot of all of the gang's pokemon looking at the fight, Wakashamo's and Kinogassa's hits are shown in slow motion. 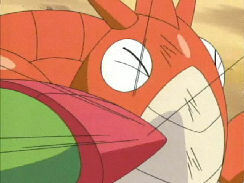 The first two of those hits (a slap across Wakashamo's face and a kick to Kinogassa's stomach) are not seen in the dub. Two seconds are cut from the TO BE CONTINUED... screen. Which is odd, really, because I would think that they made enough content cuts in this episode to make time cuts like this unnecessary. Has 4Kids been making time cuts for so long that they've gotten into the habit of doing so, even when it's not required?